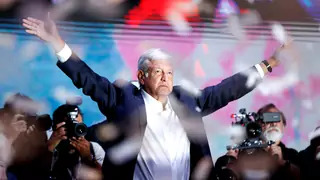 López Obrador’s lambasting of Mexico’s corruption, violence, and deep-seated inequalities resonated broadly with the country’s voters. Yet his victory stemmed in no small part from the shortcomings and outright collapse of his competitors. Second-place finisher Ricardo Anaya ran a disorganized campaign with few graspable policy positions. And five-time cabinet member José Antonio Meade, while seen as personally honest and capable, couldn’t rescue the reputation of the Institutional Revolutionary Party (PRI), undone in the eyes of voters by corruption scandal after corruption scandal. A big question now is what López Obrador will do. His campaign revealed a multitude of voices and positions, with his surrogates often contradicting both the candidate and themselves. But even more important for Mexico’s future will be how López Obrador chooses to enact his policies—and whether he will abide by the often frustrating institutional checks and balances within Mexico’s democratic political system. Here, Peña Nieto and his administration’s institutional chicanery has opened the space and set precedents for López Obrador to further erode the democratic rules of the game. Click here to read the rest of the article on Foreign Affairs.